◆ Have your kids ever used a backseat tray that just sits on their lap and brings no fun? Whether your kids are traveling on the backseat of your car, on a plane or even at home we know they deserve the best activity table for car! Our baby travel accessory gives you a convenient way to keep your infant entertained during short or long road trips or even flights. Our snack tray comes with side pouches that will help you keep everything in place and close to your little ones reach. Tall sides will prevent things from falling out of our tray for car seat. No more mess inside your car! Your older kids will also love our airline seat tray. It comes with dry erase white board that makes drawing and writing fun and easy to erase. No more paper sheets flying around your car. FREE 3 Color Pens are already included in our smart tray to make it easy for your toddlers to have fun with the tray for travel as soon as it arrives. You don’t need to go out to buy pens. 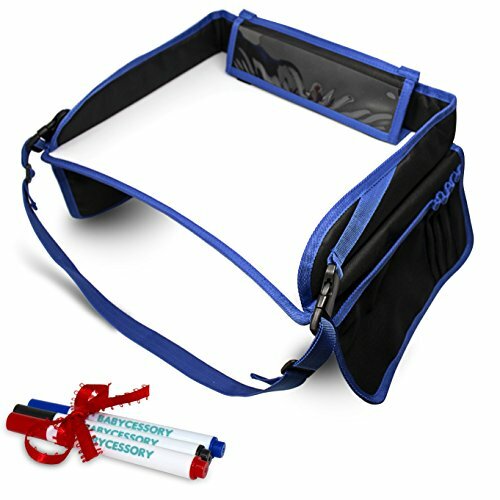 Babycessory portable activity tray is light, foldable, and easy to carry so your kids can carry it as backpack or messenger bag. From now on your child will have fun while on the backseat, and you will have hours of peace. CLICK ON ADD TO CART BUTTON AND GET YOUR BABYCESSORY CAR AND AIRPLANE SEAT ORGANIZER TABLE TODAY! ✔ STURDY DRY ERASE SURFACE; Real sturdy white board writable and erasable surface, your girl or boy will be able to use their imagination drawing or writing. ✔ KEEP YOUR KIDS ENTERTAINED, NO ELECTRONICS NEEDED; Our car seat table will keep your children entertained providing hours of fun. Your kids will forget electronic devices even exit. ✔ 3 COLORING PENS ALREADY INCLUDED; As a bonus Babycessory provides 3 coloring markers to use with the erasable surface, so that you can use your new car travel tray for kids as soon as you receive it. ✔ EASY TO USE; Our carseat travel tray is ready for fun right out of the box, there is no assembly needed. ✔ HIGHEST STANDARDS AND QUALITY MATERIALS; Our travel tray for car seat is build with the highest quality materials to the highest quality standards you should expect and includes side pockets with zippers to facilitate small items storage. Great for the car or plane! Great for the car or plane ride! My daughter loves the dry-erase board! Wipes clean. Nice pockets on the side. Perfect for travel! Loved it! Worked wonders for us on a 14 hour airplane ride. Kept my kids busy and all their pens and writing tools stashed carefully in the zippered compartment. Sat well on the airplane seat trays. LOVE IT! It came with a cover to protect … LOVE IT! It came with a cover to protect the white board, well packed and good quality material.My kid loves too use his tray at home and at the car, as a tray for regular paper and books, or as a white board. Really good idea!